What does Wheaton have to do with an HR Conference? June 5th, 2013 | News and Events. 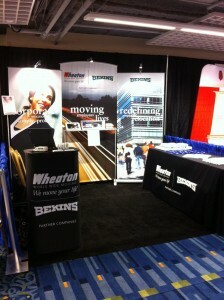 What exactly does a human resource conference have to do with a moving company like Wheaton World Wide Moving? The answer is two words: Corporate Relocation. Wheaton World Wide Moving will be heading to the Windy City on June 16th to attend a 4-day conference presented by the Society for Human Resource Management, or SHRM for short. This annual conference is the world’s largest HR marketplace with information that runs the gamut on human resource topics including, employee compensation, health and wellness programs, and, you guessed it, corporate relocation. Every year, Wheaton World Wide Moving performs hundreds of corporate moves, ensuring that employees are able to relocate easily and get back to work quickly. So, what types of information can you expect to receive if you stop by Wheaton’s booth (#1928) at #SHRM13? For starters, we’ll be informing attendees about our precise pickup and delivery dates, our valuation protection and our competitive pricing. Combining all these factors has made Wheaton World Wide Moving a preferred selection for many of the nation’s top universities, health care systems, and businesses. There’s no doubt that the conference can be a lot of work, but we want to have fun too. With an abundance of raffles and giveaways, it should be on every attendee’s to-do list to stop by the Wheaton booth (#1928) for a chance to win a Kindle Fire and many other great prizes. We can’t wait to head to Chicago and meet and interact with everyone. Don’t forget to stop by and say hi!